↑ "JPL HORIZONS solar system data and ephemeris computation service". Solar System Dynamics. NASA, Jet Propulsion Laboratory. अभिगमन तिथि 2007-08-10. 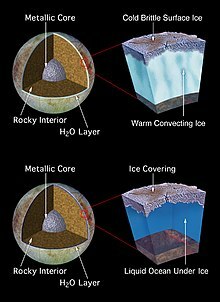 ↑ अ आ इ ई उ ऊ ए ऐ "Overview of Europa Facts". NASA. अभिगमन तिथि 2007-12-27. ↑ Bills, Bruce G. (2005). "Free and forced obliquities of the Galilean satellites of Jupiter". Icarus. 175 (1): 233–247. डीओआइ:10.1016/j.icarus.2004.10.028. बिबकोड:2005Icar..175..233B. ↑ "Europa: Another Water World?". Project Galileo: Moons and Rings of Jupiter. NASA, Jet Propulsion Laboratory. 2001. अभिगमन तिथि 2007-08-09. ↑ Tritt, Charles S. (2002). 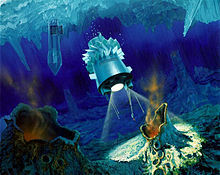 "Possibility of Life on Europa". Milwaukee School of Engineering. अभिगमन तिथि 2007-08-10. ↑ Friedman, Louis (2005-12-14). "Projects: Europa Mission Campaign; Campaign Update: 2007 Budget Proposal". The Planetary Society. मूल से 2006-02-15 को पुरालेखित. अभिगमन तिथि 2007-08-10. ↑ David, Leonard (2006-02-07). "Europa Mission: Lost In NASA Budget". Space.com. अभिगमन तिथि 2007-08-10. ↑ Cowen, Ron (2008-06-07). "A Shifty Moon". Science News. ↑ Hsu, J. "Dual Drill Designed for Europa's Ice". Astrobiology Magazine.